There was a combination of dust and rust on every surface in sight. When we arrived that morning we also came across the “tenant” of the building who thankfully left us to our work. My model, professional as ever, lay down on this rust, rickety bench and I perched precariously on top of the rusted out bench rails. Before we start: Can you tell a difference in the image quality between the two images below? The image on the left was taken by my phone, an iPhone 6, and the photo on the right was taken my my DSLR camera, a Canon T3i. Technology has gotten to a point where it doesn’t matter what tool you’re using to shoot with. What matters is what your shooting and your basic skill. So here are a couple of tips and tricks that will help you take better pictures with your iPhone. 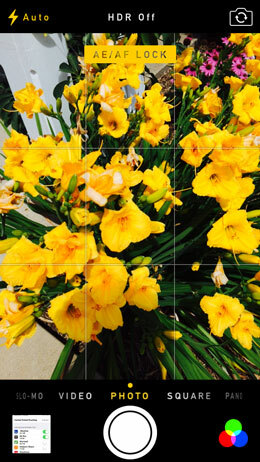 In the camera settings on your iPhone you can turn on the grids. I love the grids because it allows me to position the photo subject in a way that looks creative. If you’re interested in learning more about creative positioning or turning on your grid settings, click here. No-one like blurry photos, so learning how to use the auto-focusing feature of your phone is important. When you have the image subject in the frame, just tap once on the location that you want to be the photo’s focus and snap your photo. If you’re going to be taking multiple photos of the same subject then it’s best to choose your focus point and instead of tapping on the screen, you hold it down until you see AE/AF LOCK. This means that your focus point is locked in and will remain in focus until you’re done. When you’re taking photos from a top-down angle, you’re phone’s gyroscope will automatically sense this and place two crosses on the screen. Lining up the two crosses means that your phone is perfectly horizontal and therefore all of your flat-lay images will be perfect.